I didn’t bother to go to an Apple Store yesterday because all the press I said it would be online orders on the 11th with units appearing in stores later. So I figured — as is typical with Apple — there’d be no demo units. But I learned today from Twitter that people have bought it in Apple Stores. 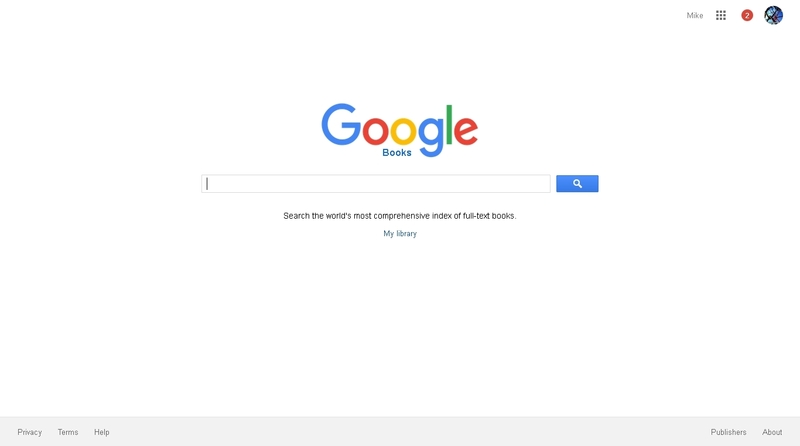 So today I might go looking for one to Google Books PDF Test. If successful — which depends on many factors aside from just finding one, like good WiFi — I won’t be posting many screensnaps because they’ll be ginormous and my image storage space is limited. These Pro units might be segregated too, so I’m not counting on being able to use, say, a nearby iPad Mini to do a quick video. If I don’t get to do this today, then it’ll be the weekend for sure. 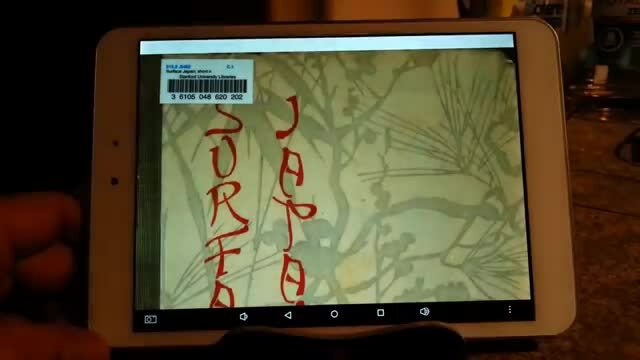 Photos taken with the 7-inch Nook tablet. Blurtastic because I couldn’t stretch the security tether to get closer. 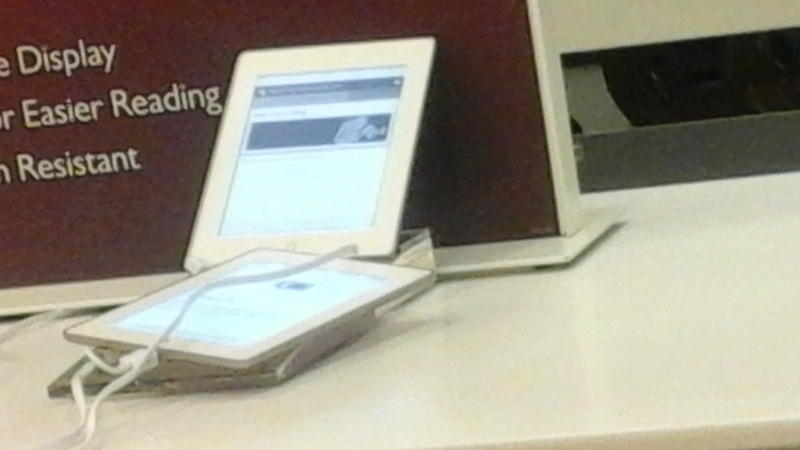 I stopped in Barnes & Noble for another fondle of the Nook Edition of the Samsung Galaxy Tab S2 8.0. That screen is very, very glossy. It’s also harsh for reading. Despite the different screen modes and brightness settings I tried. B&N has really locked down the two demo units I previously tried after I published this post. That’s not coincidental. Someone panicked. Now I can’t use the button for splitscreen or multitasking and I can’t upload screensnaps to this blog or even email! They also locked down the Notifications swipe-down gesture! However, they didn’t cut off Install Unknown Sources. 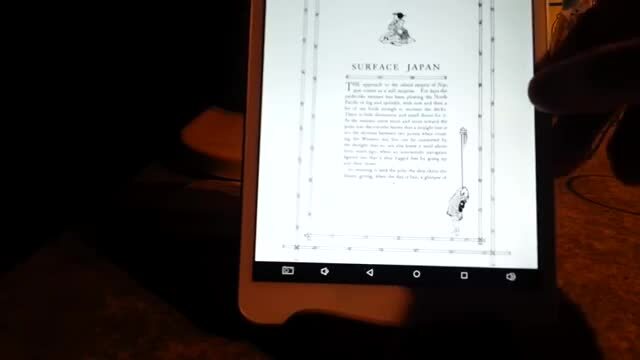 So I got evil and downloaded Google Play Books and the Kindle app. Both were a pain to get. The Kindle app came from Samsung’s app store. The Google app from the Play Store — somehow (I had to do some contortions I don’t recall now). Neither of them would run as-is. Both wanted me to sign into my Amazon and Google accounts before I could try anything. No. I deleted both apps before I left B&N. 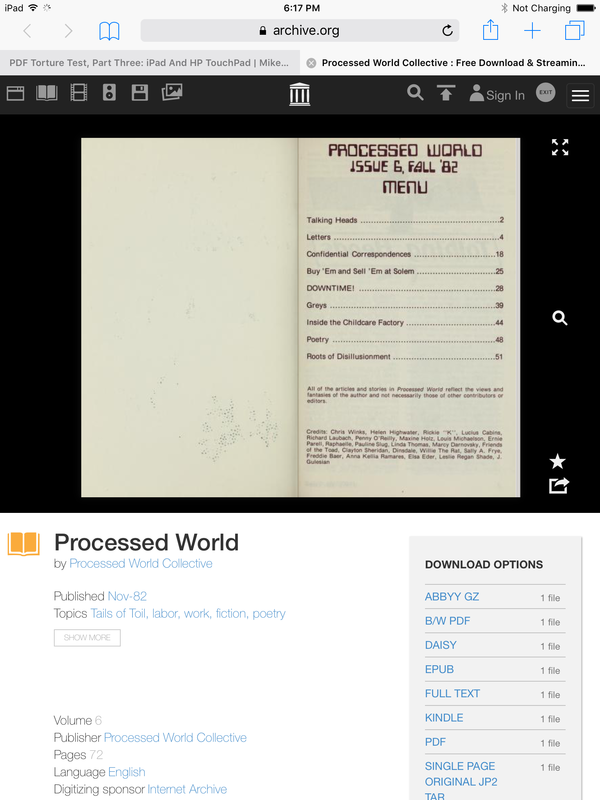 The Processed World PDFs from the Internet Archive are hell on wheels. They use JPEG2000 images which bring just about everything to its knees. Details might have to wait until Monday. Off to try this file on the Samsung Galaxy Tab S2 8.0. This post will be shorter than the one for the iPad Air 2, despite the fact the test was even bigger. I just didn’t take screensnaps of everything. Enlarge that to see how slowly the thumbnail images are rendering! By now, iOS 9 should be on all demo devices at all Apple Stores. A quick way of knowing is to quickly double-press the Home button to call up the Card View. 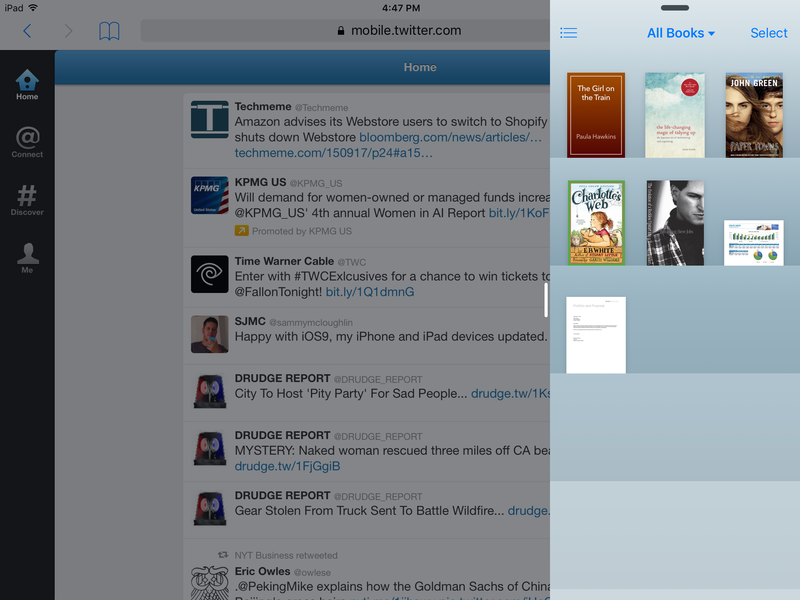 If it looks more like a carousel than a set of separated cards, then it’s iOS 9. “Peek” view, where the leftmost app (Safari, here) becomes inactive.